Beyond our well-known achievements in custom geometry, Parlee was also first to create a sub-900 gram carbon fiber road frame. A few years later we broke the 800-gram barrier. Along the way, our designs have been recognized with major accolades including Bicycling Magazine’s Editors’ Choice, Race Bike of the Year (Cycling Weekly) and Eurobike Design awards. At Parlee, our focus never strays. We constantly engineer, test and refine every tube shape to meet specific goals. From ultra-light, super-stiff race bikes to silky smooth endurance, gravel or cyclocross machines, each one is purpose-built for a specific type of ride. It all starts at an authorized Parlee dealer, where a trained technician takes precise measurements and gathers all the essential customer information. 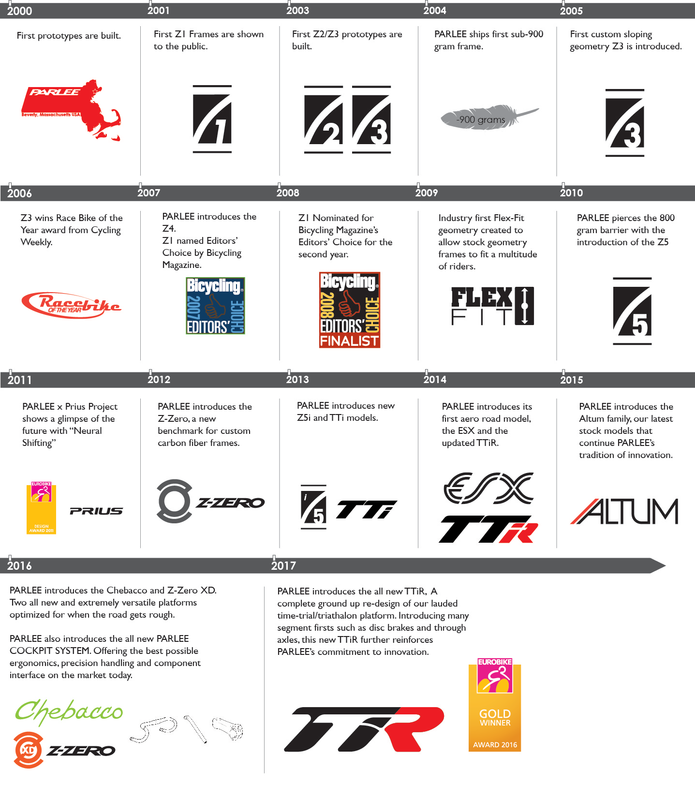 This information is then delivered to Parlee’s state-of-the-art Massachusetts headquarters, where we use custom CAD software to create the blueprint of your perfect bike. Before a single tube is built, we send you a document to double-check every detail. Every Parlee frame starts with high-modulus, uni-directional carbon fiber tubing. These tubes and sub-assemblies are produced exclusively by Parlee, and each one is meticulously inspected, then mitered to size. After the ends are cleaned and media-blasted, the tubes are inspected again. The goal is create the perfect surface to work with, which is critical to long-term durability. This process is one reason that Parlee frames are backed by a lifetime warranty. These custom carbon tubes are then selected and assembled based on a customer’s desired ride qualities. We use specially designed jigs that are accurate to sub-1mm tolerances. Each lug is mated by hand around the mitered tubes, which allows us to customize the stiffness level. Correct fiber orientation is key to frame strength and ride quality. Frames are put through a proprietary heating and pressurization process that creates an unbreakable bond. This proprietary molding process ensures a consistent surface finish. Next, frames are hand-sanded and cleaned before small parts are installed. All of our carbon fittings such as cable stops and front derailleur mounts are made in-house. This helps us achieve the lightest, strongest connections between the frame and its components. When it comes to paint, Parlee customers have unlimited color choices. After each frame is assembled, it goes through an exhaustive wet-sanding process, where progressively finer grit paper is used to produce a mirror-like shine. Once the final paint is applied, the total build time for each frame is about 40 hours, up to four times longer than that of the average custom bike. Our average delivery time is about 30-45 days.